At the start line. The line on the ground under the bike is the Prime Meridian, at Greenwich. A bit of a cool morning to be in the tent – I was sleeping in the beer garden, right next to the Danube, as it was still too early in the season for most beer gardens. I will have you know that I was offered this position by the campsite owner, it was not a case of falling asleep right outside the pub. In spite of the ice on the tent, I was actually pretty warm. Exactly. You’re not in Greece anymore. 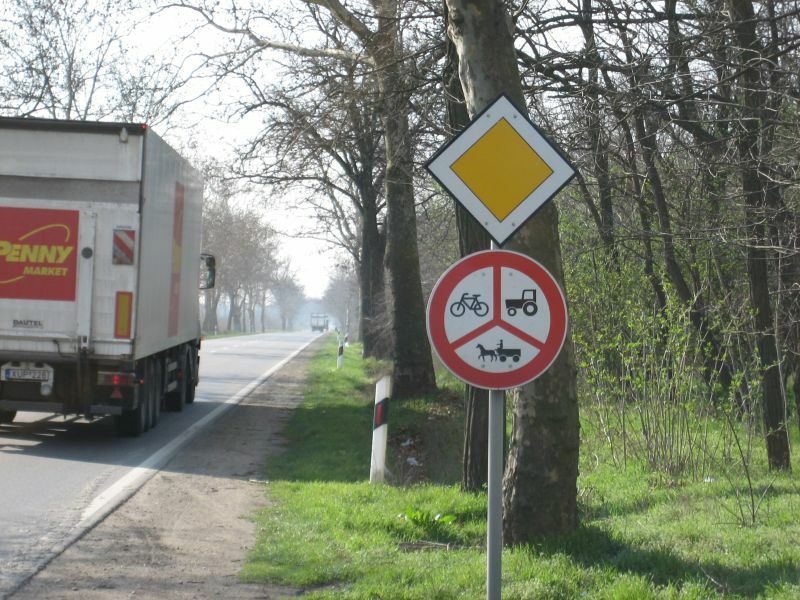 In Hungary there were two roads going in my direction – one a motorway, then this one, which had “no cycling” signs – I just ignored them, and the police left me alone. One time I tried taking a back road, it was blocked by army men with guns. So I went back to this road.